Be the first to share your favorite memory, photo or story of Robert "Bob" . This memorial page is dedicated for family, friends and future generations to celebrate the life of their loved one. 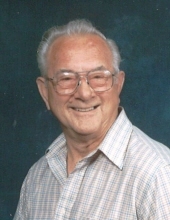 Robert “Bob” J. Vardeman, resident of Molino, FL passed away on Monday, November 5, 2018 at the age of 86. He was born on October 3, 1932 in Lufkin, TX. He is preceded in death by his wife Agnes; brothers, Kenneth H.Vardeman; great grandsons, Tallen and Travis Vardeman. Bob is survived by his wife, Dorothy Vardeman; sons, Gene (KieAnn), David (Stephanie), and Kenneth (Lelon) Vardeman, and William and Robert Ellis; daughters, Victoria Bolton and Dorie Whitt; grandchildren, Winston (Julia), Gene, Sonja, Kendra, Alicia (Zollie), Joey (Jessica), Sarah (Brett), Dillon (Shelly), Toshia (Scotty) Woods, Amy (Will) Sweet, Jessica Ellis (Justin), Scott Ellis, Billy Ellis, Danny Bolton, Wayne (Adrianne) Bolton, John Allen Bolton, AJ Whitt, Jonathan Whitt, and Lee Whitt; and nineteen great grandchildren. Bob served in the Navy aboard aircraft carrier Wasp in the Korean War. He also put in 30 years of civil service at the Fuel Branch upon NAS Pensacola, FL, where he worked his way up to Branch Manager. He was also a Volunteer Firefighter/First Responder at his local fire department for many years and respected by all. Everyone knows the name “Pop” and exactly who that is when spoken. He was a pillar of his hometown and outside his hometown area. Many people outside of this area knows the name Pop and the respect people have for him when spoken. Funeral services will be held at 11AM on Saturday, November 10, 2018 at Faith Chapel Funeral Home North with Pastor Bryan Calhoun officiating. Burial will follow in Morgan Cemetery. The family will receive friends on Friday, November 9, 2018 from 5PM to 7PM at the funeral home. Pallbearers will be Danny Bolton, Wayne Bolton, John Allen Bolton, Hunter Franklin, Zollie Linton, and Joey Vardeman. To send flowers or a remembrance gift to the family of Robert "Bob" Jack Vardeman, please visit our Tribute Store. "Email Address" would like to share the life celebration of Robert "Bob" Jack Vardeman. Click on the "link" to go to share a favorite memory or leave a condolence message for the family.